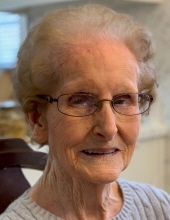 Charlotte H. Smith, 95, of Fayetteville. passed away on April 9, 2019. She was born south of Fayetteville on February 3, 1924 as the youngest of three girls born to Benjamin Hightower and Eula McBride Hightower of Fayette County. She is preceded in death by her husband of almost 60 years, William Harold Smith and leaves behind their daughter, Mary Ann Cauthen; son-in-law, Lanny Cauthen; granddaughter, Laura Cauthen Dorsey (Rick); grandson, Jon Cauthen (Jeannie); and great-granddaughter, Summer Dorsey. Charlotte graduated from Fayette County High School in 1941 and then attended Crichton’s Business School in Atlanta. During WWII, she worked as a secretary for the Third Army in Atlanta. After the war, she took time off to start a family and later worked in the office of Greer Industries in Fayetteville from 1953 to 1975. She then had the pleasure of working for Drs. Helen and Ferrol “Sambo” Sams in their medical office on North Jeff Davis and at Yorktown for almost 20 years until she retired at the young age of 81. In the early 1940’s, Charlotte met William Harold Smith. He was from Rico, GA in south Fulton County. At that time there were few paved roads; therefore, sometimes he got stuck in the mud coming to visit Charlotte in Fayetteville. Harold joined the U. S. Naval Reserve in 1942 and served during WWII from 1943 to 1945 in the Seabees, where he was stationed in the South Pacific. While he was away, they corresponded frequently and continued to see each other when he returned. They were married on September 21, 1946 at her parent’s home in Fayetteville. The family will receive friends on Thursday, April 11, 2019 from 5:00–7:00 PM at Carl J. Mowell & Son Funeral Home in Fayetteville. A Celebration of Life Service will be held Friday, April 12, 2019 at 2:30 PM at the Fayetteville First United Methodist Church, Fayetteville with The Reverend John Barnes officiating. Charlotte will lie-in-state from 1:30-2:30 PM prior to the service at the church. Burial will follow the service at Fayetteville City Cemetery, Fayetteville. If you so desire, please direct any donations in Charlotte's memory to the Fayetteville First United Methodist Church website at: https://onrealm.org/FFUMC/Give. To send flowers or a remembrance gift to the family of Charlotte Hightower Smith, please visit our Tribute Store. "Email Address" would like to share the life celebration of Charlotte Hightower Smith. Click on the "link" to go to share a favorite memory or leave a condolence message for the family.